I'm pretty sure Batman is trying acid here. 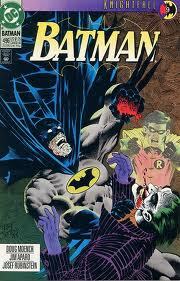 In this installment of Knightfall Tuesday Batman gets some throw down revenge on The Joker. Batman feeling bruised and broken after his fight with Firefly.Batman then learns that the mayor has been taken hostage by The Joker and The Scarecrow. A trip to the mayors mansion proved futile after Lt. Bullock trips a wire that blows the place up. Batman intervenes and saves Bullock from going up with the mansion. The Joker and Scarecrow uses the mayor to call Gordon to lure him into a trap. Joker and Scarecrow enter the Gotham City tunnel under the Gotham River. They blow up a few cars and trucks creating a large traffic jam. The traffic jam keeps the police at bay at the entrance to the tunnel. Batman arrives and takes charge into the tunnel to save the mayors life. Joker splits up with Scarecrow who runs into Batman first. Batman beats down on Scarecrow but Scarecrow manages to spray Batman with his fear gas. Batman sees his greatest fear which at the point was the death of the second Robin, Jason Todd. Batman proceeds to beat The Scarecrow to a pulp. Once he finds The Joker, who is busy tormenting the mayor, Batman starts to beat on him too. To be quite honest Batman is very brutal in his beating of the clown prince of crime. Knowing that they've pissed The Batman off, Joker and Scarecrow use a rocket launcher to blow a hole in the roof of the tunnel. Since the tunnel is right under Gotham Harbor water starts to flood in. Batman makes the choice to save the mayor while the villains get away. The last image we see is Batman and Mayor Krol running from a huge wave of water in the tunnel coming at them both.